Here we have what I believe to be a giant mesquite bug, though I would gladly welcome corrections from any eagle-eyed entomologists who happen to be reading today’s post. 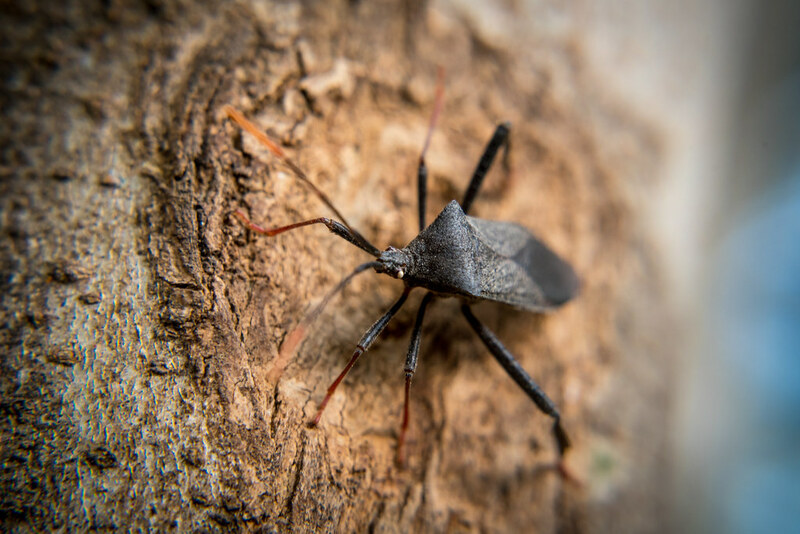 a leaf-footed tree bug (acanthocephala terminalis), which I was able to identify with the help of some very nice strangers on Facebook :) This is another result of my continual experiments with close-up filters (see last week’s post for more details) and the more I use these little lens attachments the more I like them. And, the more I can hardly believe the results I am getting for such a cheap price. One thing that has always fascinated me about macro photography is its ability to capture bugs and insects with incredible detail–often of the sort that is hidden from normal human eyes. It is something I have tried from time to time with my lenses but thanks to a rather weak maximum magnification it has mostly eluded me. Even with the close-up filters I am still having a lot of trouble because they require you to be very close to your subject–a situation that a telephoto macro lens like Nikon’s 105mm f/2.8 beast would be able to handle much better simply because it could be positioned farther away and focus across a much wider range as opposed to only being able to focus up close. However when I was playing with my kids in the backyard recently we came across several of these bugs crawling on a fence and since they don’t generally move all that quickly I thought it would be an ideal situation for playing around with some close-up shots. At the time I did not have my camera with me but after dinner the three of us went back out and, with our glimpses peeled, soon spotted the small herd of six-legged friends which had by then migrated from the fence to a tree. We spent about ten or fifteen minutes moving in and around the tree, the boys looking for bugs while daddy rushed in to get some pictures, and soon discovered that while these insects don’t move very fast they do have a tendency to fly away at inconvenient times such as when a big ol’ Nikon DSLR is hovering about an inch and a half away. Out of 17 shots this was the only one that turned out, and even this one isn’t as good as it could be because the eyes of the bug are just barely out of focus. If you click on the image and look at the high-rez version on Flickr you will see that the in-focus area, or depth of field, is just behind the head and not actually on the head itself. • When dealing with close-up photography you have a super duper shallow depth of field even at smaller apertures. The depth of field here is less than 1/4 inch and I was shooting at f/8. • When shooting with close-up filters the autofocus doesn’t work too well, and even when it does the image often comes out a bit soft. • I have learned that for close-up shots like this one it’s best to focus manually (yay for back-button focus!) which, combined with a moving subject and jittery photographer, make nailing focus even more tricky. The plane of focus is always a challenge with this type of photography. It can be helpful if one aligns the plane of the target with that of the camera sensor. Can you explain what you mean by that, Chris? I assume you mean to put the plane of the target so that it is parallel to the sensor, but I could be wrong. I appreciate any tips you can offer with this type of photography! I have macro filters too. I come across the same challenges, but it is still neat to experiment! Nice shot! Thank you Lisa! And I agree, it is fun to experiment and try new things. Using these filters has opened my eyes up to a whole new type of photography! I have a set of these lenses too, but rarely use them. Maybe I’ll take them out and experiment. I like the results you are getting, and it’s always a good thing to “push the envelope” a bit and try new things. Thanks for sharing your experiences.